It was a hectic start of a day: by circumstances beyond my control, I lost the 7:04 AVE train from Lleida to Madrid. I had never lost it before, and at that moment it affected me symbolically. When I changed my ticket, it also affected me economically. But that first part of day was developed without further incidents, after a placid trip and a productive day of work. The second part of the day began at 19:30, when I stopped at Bilbao Metro to go to one of the major beer places in Madrid in recent years, with a great task of diffusion and evangelisation thanks to the good number of events that are held in there along the year. With very food-related offer and interesting lunch menus, I can remember some memorable nights of my previous life between the walls of the long-shaped premises of La Tape. The 8 different taps are still there, with an always varied offer announced on the blackboard in front of the bar, as well as their take away food service, called Tape Away. I drank a fantastic Mad Brewing Eukanot, ideal to prepare the body for a hop-forward evening experience. And although it was certainly not the perfect pairing, I happily accepted a small tapa of gazpacho: fresh, with a touch of arugula, and really good. After a long day, it was time to have dinner, and the place to choose was clear to me: I guess the name caught my attention when I first saw it, so I had no doubt to visit Pez Tortilla, in Calle del Pez. 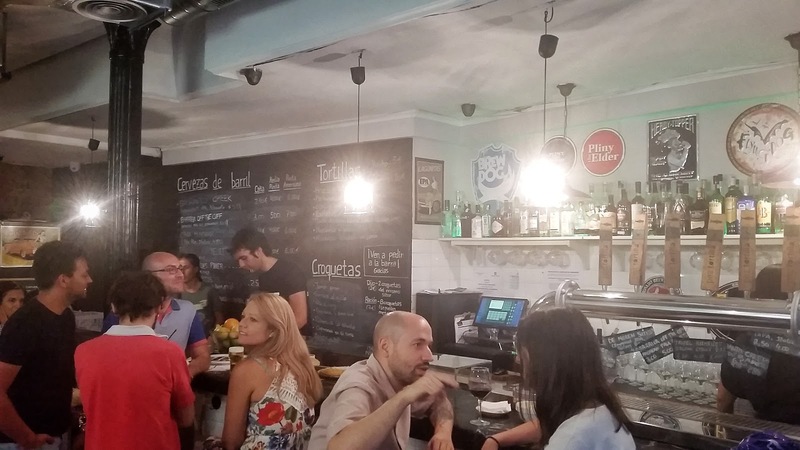 A small bar that has had the occurrence of reducing its offer to half a dozen varieties of two of the most preferred tapas among locals, omelette and croquettes, to merge them with an attractive beer offer. 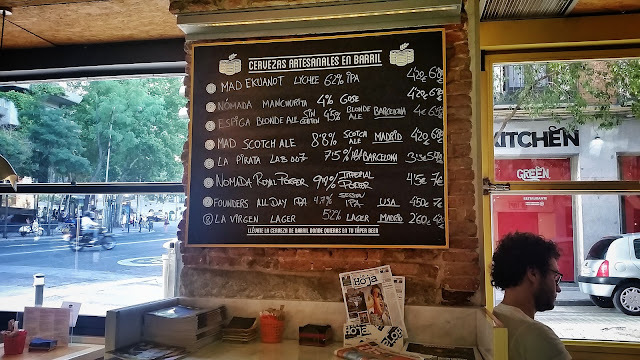 An offer which, incidentally, comprises 6 taps of craft beer plus 1 of Mahou Clásica: the most popular at the beginning, although the consumers are increasingly innovating when they order. I went for the ham croquettes and an delicious omelette pincho with brie, ham and truffle, accompanied by a Speranto Creek: a New England IPA brewed in Toledo -hooray for globalisation-, fresh and tasty, although with a light yeasty touch. We turned up early, and we were on Monday of a pre-holiday week, but normally we would not have even get close to go inside. And, frankly, I'm not surprised. With a satisfied stomach, we went to a boozer I visited several times in the past. 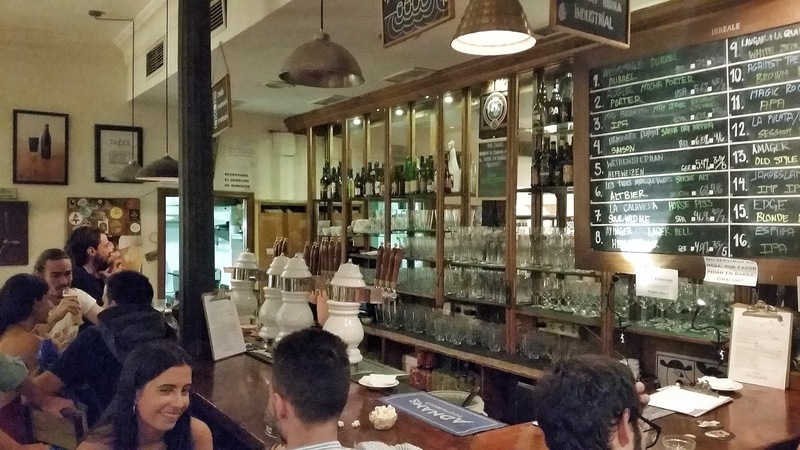 The oldest brewpub in Madrid -after Estrella Galicia acquired Naturbier- and a true masterpiece on how to take advantage of all the limited available space of a property, Fábrica Maravillas skilfully captured from the beginning the essence of what madrileños expect to find in a bar. Hence, both before and after dinner time, the place is usually quite busy. 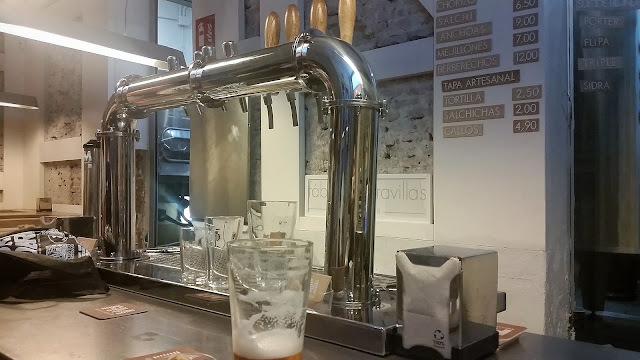 The original 8 taps are still there, but I saw some novelties such as the offering of small tapas -something obvious, that a lustrum ago I pointed out as necessary-, as well as some infographics to understand what is going on in the brewing area, on the back. Great nights in this bright and modern place, which I could recall by drinking their To The South, a Session IPA that made me realise that 4 years ago, when I left the city, the concept had not yet been invented. Already halfway to the end of the route, we arrived at The Stuyck Co, launched in December 2015. The property is quite deep, with the bar and its 14 taps right at the entrance, and a wider table area at the end where one can eat quietly. Decorated with grace, it especially stands out for its modern aesthetic combination, based on bricks and wood, which make it a frankly cozy place. After a frustrated attempt to taste the house Berliner Weisse, I opted for a Red Flanders, but not a single one: if I was to be told in 2013 that I would be drinking a draft Rodenbach Alexander -a classic beer that did not make it to the 21st century, recently relaunched- in Madrid, I would not have believed it. 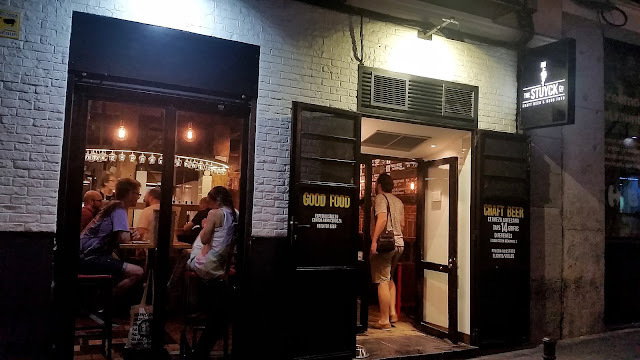 In a nutshell, this one would be the typical craft beer bar to be found in most big European cities, where you go to grab a good hamburger with a varied beer offer to match it. And to enjoy it properly. The last stop of the day was a safe bet. Almost at the exact starting point of the tour drawn for this first day there is another of the great classic Madrid bars in recent years, in its second stage after being born in the neighbourhood of Chueca, in Calle Ballesta. From being the -almost- unique choice for beer lovers after Animal's closure, Irreale is still in top shape, with its 16 taps and two different floors decorated with wooden furniture and beer-related signs and objects. There was nothing new since a brief visit I made a while ago, but everything remained perfect, with a great blackboard in which big European and American brewery names still shine next to a selection of the most popular national beers. I happily drank half a pint of Amager Baby Wombat from Hell, an intense and tasty Porter that was a classy way to call it a night. Due to weekly rest, I could not visit The Beer Garden, a former shop converted to bar just two months earlier that would have fit the route pretty well, crossing Universidad through its northern line towards Chamberí. But I really wanted to visit the Guille Roiz's new premises, so I kept it in mind in case there was some spare time on the following nights. It began timidly with Irreale and, not long after, Fábrica Maravillas, but the 'Barrio de Maravillas' -as Universidad was popularly known some years ago- has now a good number of beer places -not all included in the route- delivering a satisfying beer experience. The area near Glorieta de Bilbao, formerly the epicenter of the city's alternative beer scene, has been distributing its weight to more southern latitudes, to the extent that in this post I write about Universidad, and not the classic Chamberí. I would even say that this whole area has lost a bit of its importance in front of Embajadores and Cortes, two adjoining neighbourhoods with many new beer bars, that have clearly attracted the beer-hunting public recently. But let's not flash forward: there will be time in the next post to explore these places, in the review of my second night in the Capital. Find more pictures in the Facebook album: Madrid 2017.